That’s the name that Kenny Who gave to this 1934 Ford. Ken originally bought the car back in July 1989. He found the old rolling chassis in Old Lyme, Ken said, "it had been channeled back in the early sixties, but never completed." Ken kept the same rake that it had from back then. 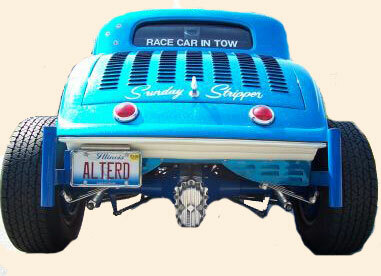 Ken built the car up as a sixties era drag coupe. Ken started in 1989 and had it finished by 1996. Ken did nearly all of the work on the car, other than the final paint and upholstery. The car even came across the river to Wholand on the Wholand Ferry Service, then a short stint in Broken Arrow, OK, and eventually back to Shelton, CT. In October 2005, Alex Roberts was lucky enough to get the car from Ken. After looking it over and test driving, he bought it. He then drove it 700 miles, back to Michigan, where he lives. No problems for the whole trip. Over the years that he had the coupe he just changed little things to make it easier to drive such as lowering & moving the seats, clutch, brake and gas pedals. Gray wheel centers, black brake master cylinder, push bars, and a 1st gear trans fix were made for 2006. 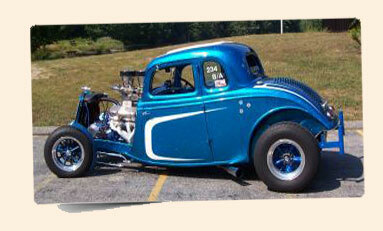 For 2007, it received new Mickey Thompson slicks and bias ply tires to go with the 60’s drag look. Also custom headers to run outside the frame rails were installed. To keep it simple, he ran inserts in the collectors. In 2008, it got some more black paint on the grille center, front axle, steering shaft & box. He also upgraded the box to a Saginaw 525, after having enough of the play in the Vega boxes. Continuing to upgrade the car, in 2009, it got an aluminum water pump, and cylinder heads for lighter weight, and maybe some more power. Along with local events, It had a good run down to Dayton, OH to meet up with the Rolling Bones crew on their way to the Bonneville Salt Flats. Head to the Photo Gallery for more detailed photos of Ken Who's Stripper. Credit and much thanks to Hot Rod Street for the history of Kenny's Ride after he sold it.